Suncheon-si, Tuesday 10 September, 11am. 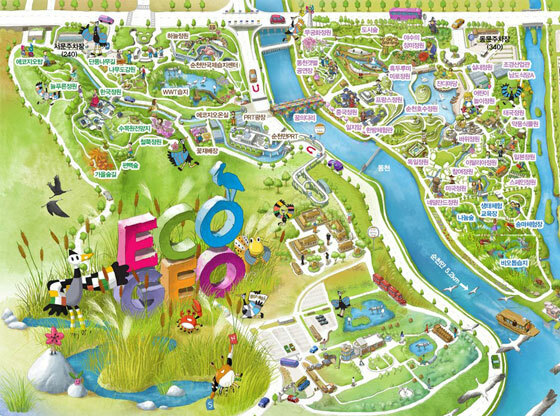 The expo precincts are shaped like an inverted triangle, its long northern baseline lying on a straight road which leads eastwards to Gwangwang and westwards towards the tea fields of Boseong. This baseline is about two kilometres long, but in the heat it feels three times that. At the Sancheong expo the sidewalks and other paths had been shaded from the sun by a wicker roof so that they almost looked like tunnels. In Suncheon there is limited shade, and the decision we made the previous day to cut short our stay there is looking sensible. The sun is beating down, and we realise we’re not going to have the energy to see the whole expo, so instead we focus on the area closest to the gates in the north of the precincts. As we finish in Hwang Ji-hae’s garden, we dally a little, regretting that there is not more time, and take a quick look at the Chinese Garden and a rather grand-looking French terrace-cafe. The Bridge of Dreams, structurally, is really rather ugly: an elongated rectangle which you could easily imagine to be several shipping containers bolted together end-to-end. And in fact that is what it turns out to be: two tubes of abandoned containers, recycled as an art exhibit, as part of the green philosophy of the Expo. The two tunnels are laid side by side in parallel, and a central walkway lies in between them. But it is not the structure itself that is important – it is the decoration. The bridge, at 175 metres long, is claimed to be “the world’s first art museum above the water”.2 The bridge has two separate displays. The exterior of the containers is rather like a giant wordsearch puzzle: a work entitled Things I Know, an endless grid of squares each of which contains a Korean syllable made of tiny mosaic tesserae. Contained in this matrix are homely phrases and pieces of advice such as “Just choose the first thing on the menu if you don’t know what to order”. 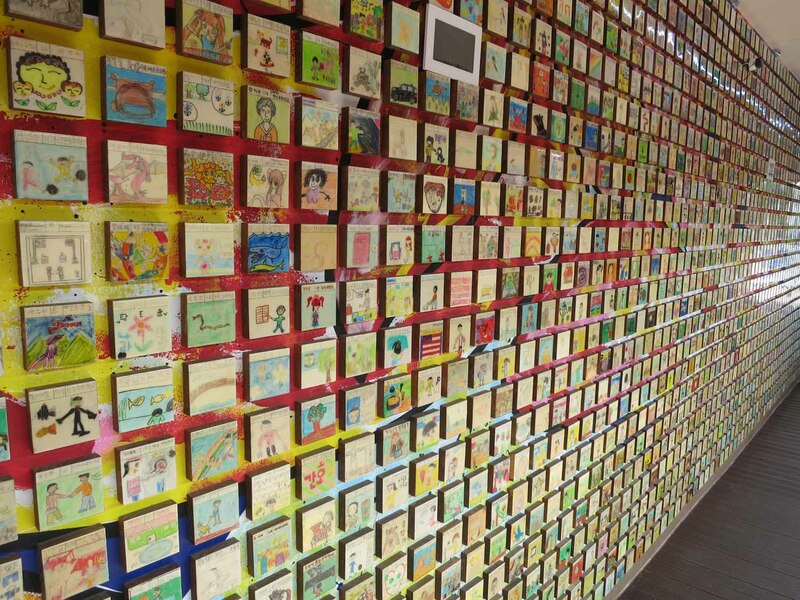 The interior of the containers is lined with over one hundred and forty thousand 3-inch-square drawings by children from sixteen countries. “The dream that the artist has cherished is now conveyed to children all over the world for moving forward to the brighter future together,” says the information board. 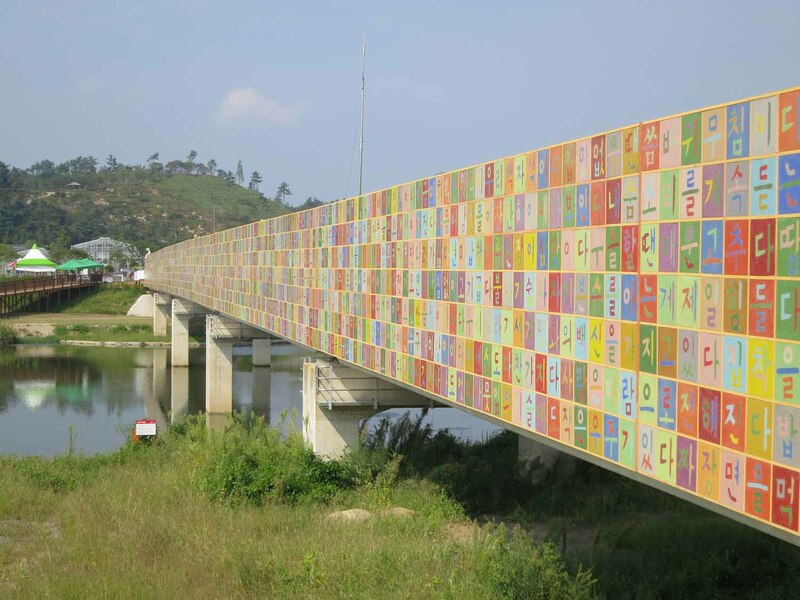 Whether the children were given a particular brief for the project is not recorded, but you could spend hours walking across that bridge, enjoying the colourful drawings. Kang Ik-joong is an artist that I can’t seem to escape. On a visit to the National Museum of Contemporary Art in Gwacheon in 2009 his work lined the walls of the central spiral rotunda, in dialogue with the massive work of Paik Nam-june, the 18-meter video tower entitled The More The Better.3 In 2010 his work adorned the scaffolding hiding the building site that was Gwanghwamun, the main gate to the Gyeongbokgung Palace – countless square paintings of mountains and moon jars in a work entitled Moon over Gwanghwamun; and at the same time there was a commercial sale of his work nearby in Gallery Hyundai. This year, apart from the bridge at Suncheon I was to come across his work unexpectedly in the new Seoul Museum. Here again he was using drawings by many different children in an installation which looks to the future.